Deposit of 10% required at the time of booking. This a full Ireland Tour bringing to many of the best known Irish locations both North and South. Starting from Dublin this tours brings you into Wicklow before making it’s way across to Kerry in the South West. We then follow the Wild Atlantic Way along the West of the country towards Donegal. It is here we then enter into Northern Ireland still following the coastline and making our way back towards Dublin again. Along the way we walk in some of the most beautiful scenic locations that Ireland has to offer. 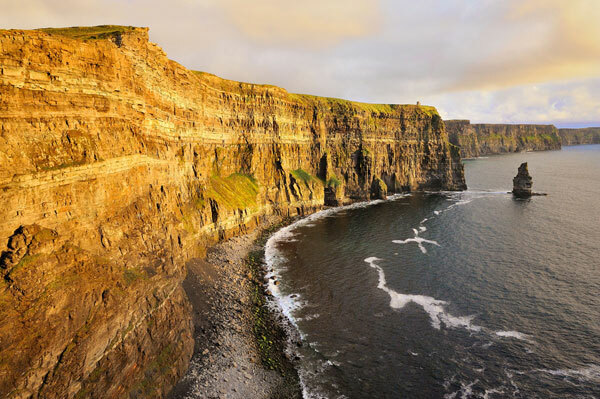 We will also visit many of Ireland’s famous landmarks such as the ring of Kerry, The Cliffs of Moher, The Wilds of Connemara, the hills of Donegal and much much more…. What’s Included: 15 Full Days exploring Ireland’s hidden treasures, The best of Guides to inform and assist you, Transport for 15 Days, Breakfasts each morning, Most Site and Attraction Entries, 14 Nights of Great Quality Accommodation, Get to see the real Ireland, The best of Irish traditional music. Memories and stories that will stay with you forever. Accommodation: Tourism Ireland Approved Guesthouses and Hotels. Whats Not Included: Lunches & Evening Meals, Optional Entry Fees & Extra Activity Options. Scenic Drive of Wickow Mountains National Park, Walk in Glendalough, Monastic site of St Kevin. Morning / Afternoon: Your adventure starts with a pickup in Dublin where you will meet your guide. Then it’s of to county Wicklow “the garden of Ireland” just south of Dublin. County Wicklow is known for its scenic beauty and its here where Hollywood come to make most Irish films e.g. “P.S. I Love You” and “Brave Heart”. Wicklow is a great place for many outdoor activities and its where a lot of people from Dublin like to spend their weekends exploring the hills cycling or walking before relaxing over a great meal and a fresh pint. We will be taking a scenic route on our way to Glendalough where you will be spending the first night. Along the way we will visit some of Wicklow’s scenic highlights such as the Wicklow Mountains National Park, The Sally Gap, the beautiful Lough Tay and the Guinness family estate to name but a few. The guide will give you some of the local folklore and history of the places. It’s also a chance for you all to get to know each other a little. Evening: When we arrive in Glendalough and organise ourselves into our accommodation we will go for our first walk. The walk will be approx 3 hours in this beautiful glacial valley. This valley is the gem of the Wicklow Mountains National park and ideal for walking. We will also visit the monastic site of St Kevin, which this area is famed for. When we return we will have some time to relax in our accommodation before dinner and a drink in the local tavern. Kerry, South Pole Inn Pub, Cliff Walk, Dingle, Unique Pubs. Morning: Today after breakfast we will be travelling south all the way down to the town of Dingle in County Kerry. On the way we will take a stop to visit the picturesque town of Adare in County Limerick. This town has to be seen to be believed with its small thatched cottages and brightly coloured buildings. It is home to Adare manor which was once home to Earl of Dunraven. We will be staying in the small fishing town of Dingle. Afternoon: On our way to Dingle from Adare we will stop along the way to visit the town of Annascaul which is famed for being the home town of Tom Crean, the great Irish explorer who shared voyages with Scott and Shackleton to the great Antarctic. On his retirement from the navy he returned home and founded a Pub called “The South Pole Inn” which is still there today. The guide will drop you all of at Beenbane beach so you enjoy a cliff walk in towards the village of Dingle – a fantastic way to arrive ! Evening: Dingle or “An Daingean” which is its Gaelic and original name is a fantastic small village known for its small quaint pubs, live Irish music and relaxed atmosphere. There is plenty to see and do in his small town with great restaurants, pubs, coffee shops, craft stores etc. What it is really well know for though is its friendly dolphin called “Fungie” which has been in Dingle harbour for years and visited by thousands of curious guests. You may also be surprised when you enter a pub in Dingle that you can also buy a new pair of shoes or have your old ones mended. Morning / Afternoon: After a hearty breakfast we will get ourselves ready for one of my favourite walks in this area, Mt Brandon. Which is named after Saint Brendan the voyager; some think he even got as far as North America. On the way to Mt Brandon we go over the famous Connor Pass with its incredible views across the Atlantic Sea and the Dingle Peninsula. Mount Brandon is a blessed mountain and there is a pilgrim trail to its summit and is one if Irelands holiest locations. It is less than 1000m but even though it is a pilgrim walk it is quite a challenge. The walk will take about 4hrs and the views from its summit are breathtaking. From it you can see the Atlantic all around you on the Dingle Peninsula, the Blasket Islands and Ireland’s highest Mountain range on the Iveragh Peninsula. 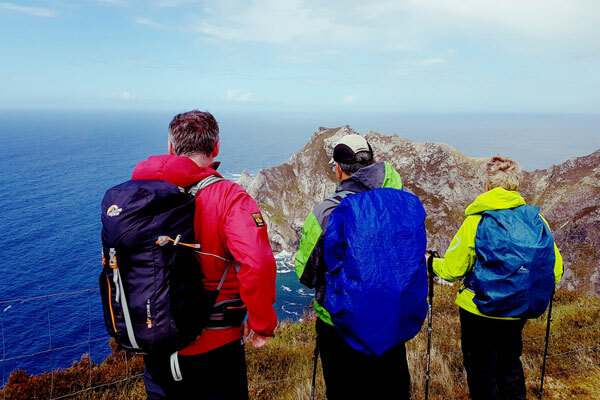 Evening: After our walk on Mt Brandon we will make our back to Dingle where you can see Fungie for yourself, meet some locals, visit some of the craft shops, enjoy some of the local seafood or just relax. 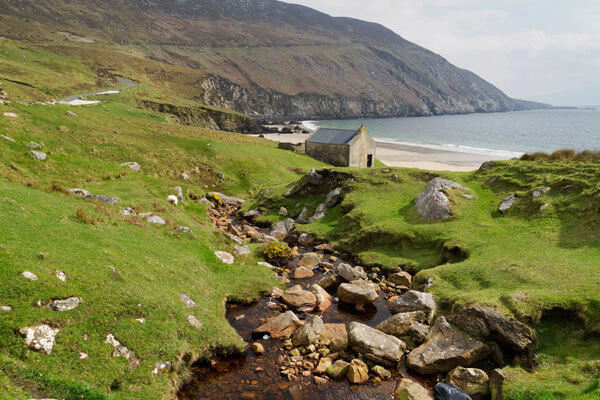 Morning: The Dingle Peninsula drive is one of the most scenic in Ireland and the National Geographic placed it in one of the top 10 drives in the world and when you do it you’ll appreciate why. We will follow this drive from Dingle to the Slea head and onto the view point for the Blasket Islands. The Islands are famous for their Gaelic writers and the whole area of Dingle is what’s called a “Gaeltacht” an Irish language speaking region. So the guide will teach you a cúpla focal (couple of words). Afternoon: The walk today is nice and easy stretch along a great cliff walk with views across the Atlantic which will bring you to the village of Ballyferriter. This is the closest point you can get to America in Europe. After our walk we will head down to the local beach for a game of “Hurling” which is an ancient Gaelic game played with sticks and a hard leather ball called a “sliotar”, quite similar to hockey. Well you can try hit the ball with stick if you can. Evening: So after our playing about on the beach while taking in the views and learning some Irish and hurling. We will make our back to our accommodation for an early night to recharge the batteries for tomorrow’s big adventure. Morning/Afternoon: Today is the big walk of the tour so it’s an early start to get over to Killarney and drop our bags into our new accommodation before heading across to Carrauntoohil. This walk is weather permitting as your safety is paramount to the guide and us. 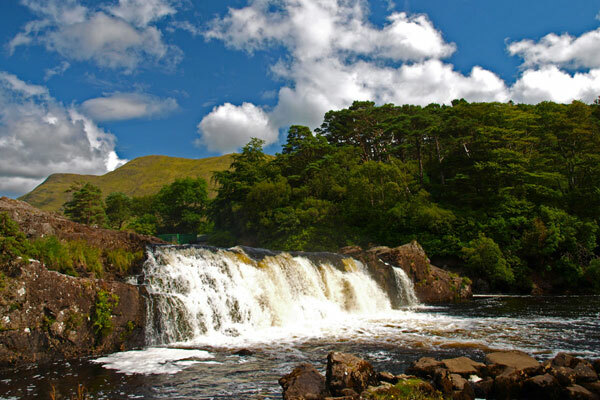 An alternative suitable walk will be chosen by your guide in the Killarney National Park depending on the weather and the groups abilities. Now all going well and the weathers good then we will head to the summit as planned. Carrauntoohil is 1039m tall, which is small if you live in the Alps but huge if you live in Holland so all due care must be taken. Thousands of locals and visitors climb this every year and you feel a great sense of achievement on getting to the top. Evening: After we get back down and catch our breath we will make our back towards Killarney. The town of Killarney is the most visited town in Ireland with the Muckross House and Gardens, its beautiful lakes, Ross Island and more it is a true treasure and one that I’m sure you’ll love. As well as all its scenic beauty there are numerous restaurants, pubs with live Irish music, areas to shop and places to chill over a coffee so you wont be stuck for something to do. Morning: This morning we are on the road again taking a route up along the west of Ireland known as the “Wild Atlantic Way” crossing the River Shannon at Terbert. The river Shannon is named after an ancient Celtic Goddess and is Ireland’s longest and most impressive river. As we cross the mouth of the Shannon on the ferry keep an eye out for the schools of Dolphins to be seen everywhere. When you dock on the far side you will be in County Clare. Afternoon: Once we are in County Clare we will follow the coast road up towards the town Lahinch. This coastal town is a surfer’s paradise and has become more popular due to the great waves here. It’s also a great holiday destination for Irish families with many other activities on offer as well. Making our way northwards we will visit Brigid’s well before we start our cliff walk towards the Cliffs of Moher. The walk is fantastic and the cliffs themselves are a true treat for all the senses. Evening: We will be staying in Doolin tonight, the capital of Irish traditional music in the west. This is a tiny little fishing port made popular due to its importance in Irish music and dance. Doolin is also in another Gaeltacht area so you can try your new learnt language skills on the locals, I’m sure they’ll be impressed. Here we can relax and enjoy a few well deserved drinks while listening to some of the best Irish musicians in the world. A great way to end the day ! Walk in the Burren, Corcomroe Abbey, Galway City. Morning: This morning we will make our way to one of the strangest landscapes in Ireland and there are a few, The Burren. This is a limestone karst and was sitting at the bottom of the sea many years ago, but you can still see that clearly today. The term “Burren” is derived from the Gaelic for “stony place”. The Burren is also famous for its many different and varied types of flora which are just unique to this area. We can enjoy our last walk together on this moon like terrain. Unfortunately, we will be bidding farewell to some of our brave adventurers today, as Galway is the final stop for the people of the ‘7 Day Tour’. Afternoon: In the Afternoon we will continue following the coast road towards Galway. We will be stopping in Galway to say goodbye to some of the friends made along the way. Galway is a very vibrant and bohemian city full of musicians, artists poets and writers. It has a relaxed chilled out feeling to it and you can easily spend a few hours just walking about and checking out all the small streets and shops. 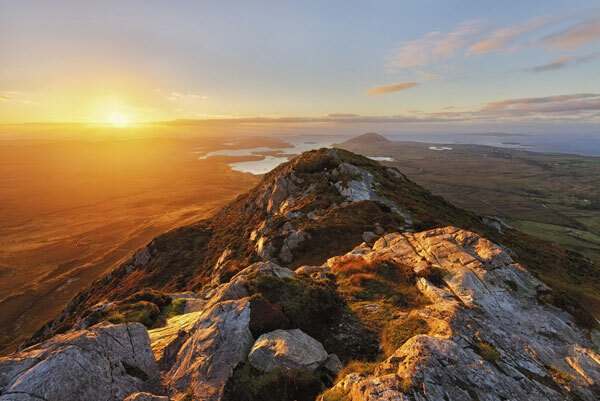 Evening: After bidding a fair well to some of the group we will make our way on towards Connemara, this is true wild Ireland, the very place you probably picture in your mind when you think of visiting here. Small cottages, stone walls, beautiful lakes and their own unique small ponies (Connemara Ponies). Connemara is also famous for the movies such as the ”The Field” and “The Quiet Man” two films I would recommend you to watch. 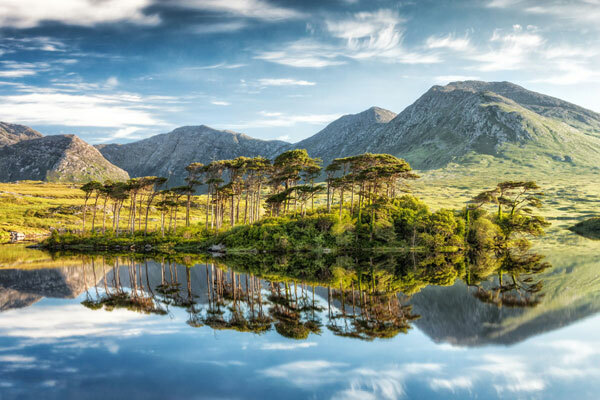 Morning / Afternon: We will be doing a few things today but first we will be walking up Diamon Hill in the Connemara National Park and then visit the famous Kylemore Abbey. 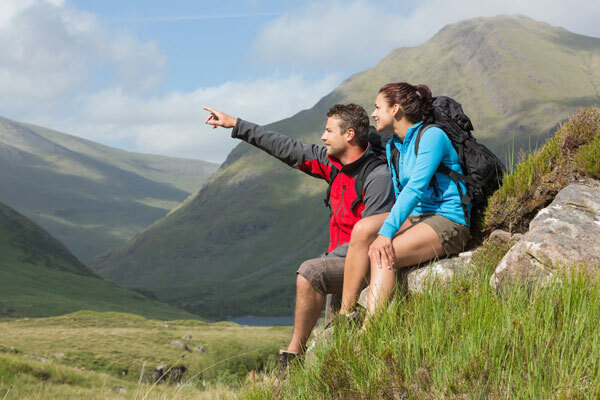 Along our walk you will see the impressive lakes of Connemara and maybe even encounter some wild mountain goats or Connemara ponies. When we reach Kylemore Abbey owned now by some very friendly Benedictine Nuns who would be happy to show about this romantically located building. The house was built by a business man Mitchell Henry who first came here on his honey moon and feel in love with the place and decided to build a very nice home here. Evening: Now a visit to Ireland would be complete without a chance to enjoy some Irish dancing and this is not just a show but also a class that you can take part in. Irish dances are called a Ceili and could probably go on all night. Local musicians and dancers come together and will show you a few easy steps to get you moving but won’t be expecting any “River Dance” moves. It’s great fun and I’m sure you’ll love it. Morning: The guide will offer you a choice of walk today depending on how the legs are from all the dancing the night before. Both walks will give you the opportunity to see some of the incredible landscape in this area and are very enjoyable. Afternoon: Both walks are not too difficult the first of which is what is locally called the famine walk built by starving Irish people during the Great famine between 1845-1849. This kind of work was called relief work although it didn’t give a lot of relief and many people died during the construction of this famous track. The track is flat and follows alongside Hillary harbour, the only natural fjord in Ireland. The other walk is over over a small Mountain called Maumean to Lough Inagh Lodge on the other side where you can relax with a hot drink and take in the views. Evening: On our return to Clifden we can relax for the evening. We will be making our way up towards Donegal in the afternoon passing through Sligo with a stop along the way to visit the grave side of one of Ireland’s greatest writers, W.B. Yeats at Drumcliffe. On the way to break up the journey we can stop for some lunch and a nice relaxing walk along the beach at Mullagmore. We will then continue onto Donegal and visit Donegal Castle. Evening: On arrival to Ardra where we will be staying for the next three night we can relax and enjoy something to eat. Morning / Afternoon: Ardara is the capital of Donegal tweed so we can not visit this area without visiting at least one tweed manufacturer. Afterwards There will be a choice of walk both are spectacular but are weather dependant. The cliffs at Slieve League are the highest sea cliffs in Europe and are truly magnificent but can also get extremely dangerous depending on the winds. So the guide will decide which is best for the group. The alternative walk is as impressive but safer walk in the Glen of Colm Cille. Evening: After our walk earlier we can relax and take some time to chill out. Morning: Donegal sits in the far north west of Ireland and has some of the most amazing beaches and unspoilt scenery in all of Ireland. This morning we will visit one of the jewels of Donegal the Glenveagh National Park. This is Ireland’s second largest National Park and covers 170Km above Glenveagh Castle. The park also contains approx 100 hectures of natural and semi natural woodland. Afternoon: After our walk we will take some time to visit the Castle at Glenveagh. Once owned by Professor Arthur Kingsley Porter of Harvard University who came to this area to study Irish archaeology. The castle is ideally located at the lake side and full of history. Evening: Donegal town is a great place to visit with a variety of restaurants and pubs to enjoy. Morning: This morning we visit an ancient fortress of the Celts called Grianan An Aileach, which is very impressive and gives you an insight of the archaeology and history of this great race. Then we make our way into Northern Ireland and the city of Derry. Derry or Doire is the Gaelic for Oak and was founded by one of our great Saints Colmcille. Today however Derry is a very lively city with great history and also one of the only remaining walled towns in Ireland. Although even with its recent troubles the people of Derry are some of the most welcoming and friendliest in all of Ireland and that’s saying something. Afternoon: After our stop in Derry we will take the most northly coast road in Ireland and visit the Dunluce castle, which sits on a rock out at sea and was once owned by the Scottish Clan of the Mc Donnell. Evening: This part of Ireland is greatly under rated for its natural beauty and scenery and we are going to spend the next two nights at the heart of it in Ballintoy. Morning / Afternoon: Today we have an incredible coastal walk all the way from Ballintoy the world famous Giant’s Causeway, which are called so due to the legend of Fionn mac Cumhaill. Others do suggest some volcanic action beneath the sea but what do they know of giants. Either way this walk is incredible, so have your cameras ready and batteries charged as this is probably one of the best coastal walks you will ever do. Evening: After our breath taking walk we will make our back to Ballintoy and relax with a pint. Morning: Unfortunately we are coming to the end of our incredible journey together but there are still a few places to take in on our back to Dublin. We will visit the city of Belfast and have a tour on both sides of the dived communities in this small city and birthplace of the Titanic. Belfast today is a thriving city and much has been done to renew it from its recent troubled past. Afternoon: On our way back to the Capital we will pass through the Royal county of Meath, which was once a province in Ireland itself and the seat of the ancient Celtic High Kings of Ireland. The area of Bru Na Boinne (Boyne Valley) is an archaeologists dream with monuments over 5000 yrs old such as New Grange, Knowth and Dowth. This area is stepped in all stages of Ireland’s great and mysterious past. Once we have arrived in Dublin you will be dropped of at your accommodation and although its not organised we do like to suggest a place where we can meet later for a bite to eat and enjoy a drink. Here is a short list of extras you will need to bring along for this walking holiday. The walks on this tour are of a mixed level with the option on some days for an easier type walk. The groups can range from 6 to 16 in size with a mixed level of fitness and age usually. We choose our accommodation very carefully and use a mix of quality Guest houses and hotels. The accommodation we use are well used to us bringing them guests after a days walk and know that they somewhere comfortable to relax and freshen up. Evening Meals A known restaurant or Pub will be suggested for evening meals in the places and towns you visit.